TwinWest Chamber of Commerce exists to champion growth and prosperity through catalytic leadership and dynamic partnerships. The TwinWest Chamber of Commerce has over 700 members who employee more than 55,000 people in the western Twin Cities. We provides grassroots support for business issues. It is our priority to ensure the business climate in Minnesota is fair and competitive and provides predictability for Minnesota businesses. For information on opportunities to be involved and make your voice heard in the public policy and the political process, join us at an upcoming Government Affairs Committee meeting. Visit our upcoming events calendar for dates/ times. 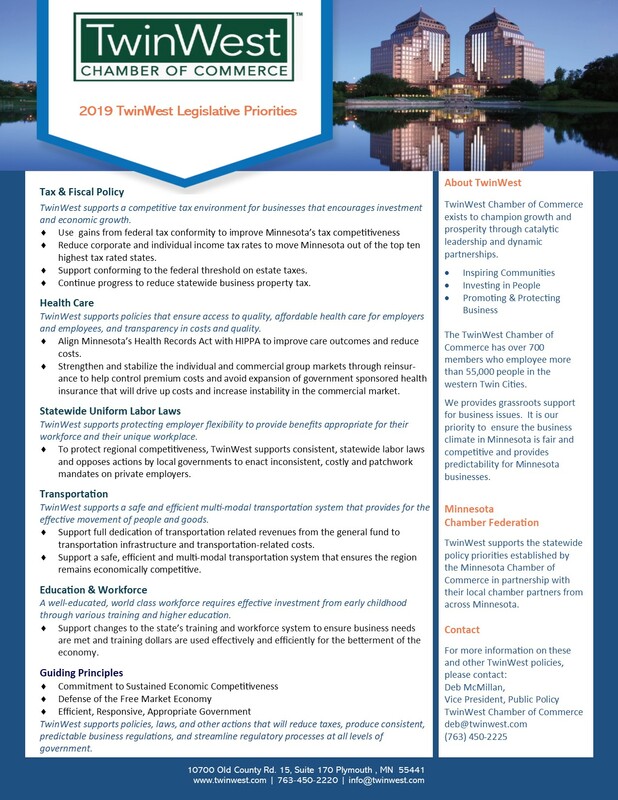 TwinWest supports legislation that will create an improved business climate for our members, our region, and the entire state of Minnesota. Each year, the TwinWest Government Affairs Committee develops policies to drive the Chamber’s efforts during the legislative session. These policies are published in our annual Business Agenda, available online and in print. The Business Agenda is intended to give business leaders a tool to better understand our positions and to get involved in bringing our message to the Capitol.